PRAYER PROMPT ••• I am blessed to be connected with so many amazing writers. Writing is an isolating activity, yet these friendships and acquaintances inspire and encourage me on days when I’m just not feeling the writing thing. One of the great things I’ve learned from my writing circles is the idea of a word of the year. I did it for the first time in 2017, and it so blessed me. “Selah,” (pause, praise, and pray) was my 2017 focal word. God put this on my heart in November and several conversations have solidified that yes – I heard Him correctly. 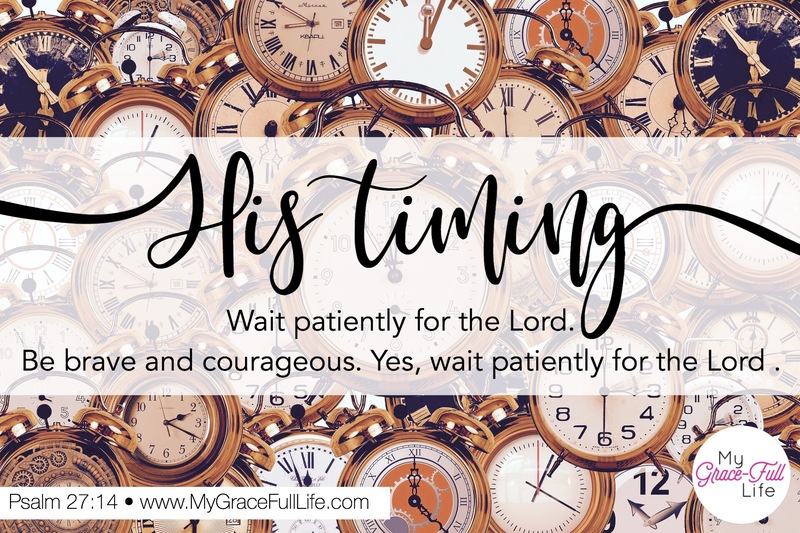 I have spent much of 2017 in a pattern of waiting, and in 2018, I’ll continue to wait, but with the help of my word of the year, I’ll remember that His timing is perfect, not mine. For me, timing represents several things: waiting, trust, hope, faith, and patience. I am waiting for God’s timing. I am trusting in His timing. I have hope in His timing. I have faith that His timing will be perfect. I am patient because I know He hears my prayers; I know my prayers line up with His will; and I know He will answer me. This year will be about letting God’s timing prevail, rather than pushing for my own timetable and agenda. But here’s the first lesson of my word: God is never late. He shows up on time, every time. As we march forward into 2018, I know we all have hopeful expectations for what this year may bring. I pray it brings you many great blessings, but I know they will all arrive in His perfect timing. Today, as you pray, ask the Holy Spirit to lead you and guide you this year. Ask Him to help you be steady and patient; to live life moment by moment, savoring the great goodness of our Heavenly Father, and trusting in His amazing timing. A great first blog post for the new year! I always love your post. Especially about timing and plan(s). We all go through the whole timing thing. “Come on Lord!” I’ve gone through that several times and each time I don’t get a response right away. By not giving use the answer right away and making us wait, we appreciate it when he does answer our prayers. It is his timing not ours (as much as we would like it to be). Happy New Year! ❤️❤️❤️ Happy New Year, Friend!!!! I’m with you, dear Denise! Happy 2018! Hugs! May God bless you in all you do this New year. He is in control and 2018 can be the year for an incredible breakthrough. Thank you! Happy New Year! Praying for God’s great blessings on you! Thank you; Happy New Year to you too!